PT. Jakarta Tourisindo (Jaktour) that owns six hotels, one plaza and sport center plans to develop its business in tourism and travel sectors by intensifying its cooperation with government and public.
" Jakarta Governor once told me that PT. Jaktour is not only managing hotels, but also tourism and travel sectors"
"Jakarta Governor once told me that PT. 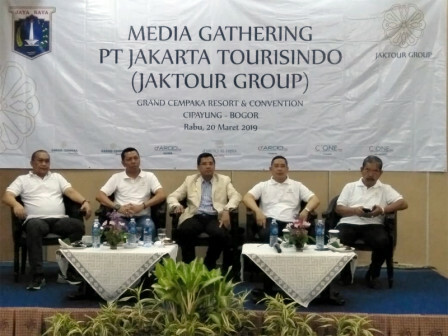 Jaktour is not only managing hotels, but also tourism and travel sectors," mentioned Geraard Jeffrey Zacharias Rantung, PT. Jaktour President Director at Grand Cempaka Resort, Cipayung, Puncak, Bogor, West Java, Wednesday (3/20). Thus he tries to improve its income and occupancy rate in property business then empower all of his employees to promote Jaktour's facilities. "I ask our office boys up to commissioners to promote Jaktour's hotels both in Jakarta and Bogor to their friends and families," he added. PT. Jaktour Main Commissioner, Budi Siswanto mentioned, his side also tells several SKPDs to use Jaktour's properties when they have activities outside the office. "Alhamdulillah, some of them have used our facilities," he said.